Flash Week draws to a close with a few more Rogues and a new pose. 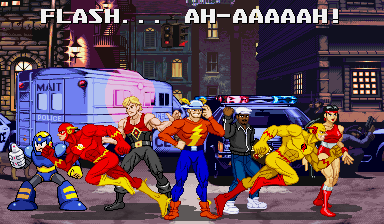 Captain Boomerang and Golden Glider each get a new scratch-made custom sprite and mini-logo while Barry Allen and Professor Zoom/the Reverse-Flash get a shared new pose. All of these things have been added to the GFX Generators. Flash week keeps rolling along! 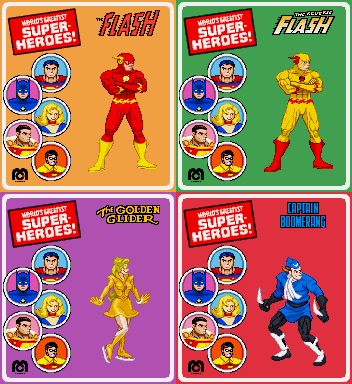 New sprites of Wally West (Justice League Task Force) and the Mirror Master have been added to the Custom Sprites gallery and GFX Generators. Mirror Master’s mini-logo is in there, too. 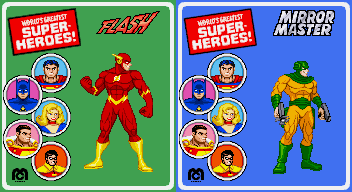 A new sprite of Flash from G.I.JOE, JL-JLU Wally West, Jay Garrick from the cover of Flash Comics #1 and Trickster with the yellow/orange/blue outfit were added to the G.I.JOE and DC Galleries. A Grandmaster Flash mini-logo was added to the new Music mini-logo gallery. 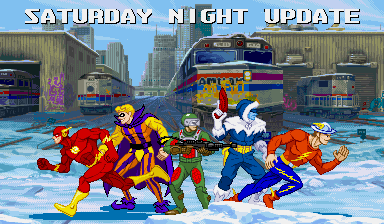 All of these things were added to the GFX Generators, along with a new Superfriends palette for Captain Cold. I’m pretty sure some of you just new this pun was coming. 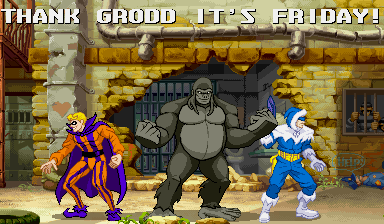 Gorilla Grodd, Captain Cold and the Trickster have been added to the Custom Sprite gallery, mini-logos for Grodd and Trickster were added to that area’s DC gallery and all these things have been added to the GFX Generators. Arcade Quartermaster just added a bunch of game shrines today, so give that site a visit, too! The Flash and the Reverse-Flash get SFA3 portraits! They’re in the custom portrait gallery and the GFX Generators (their SFA3 name graphics are also ready for the SFA3 Vs. Screen). Quicksilver was feeling a bit neglected, so he gets a portrait that fits the X-Men:Children of the Atom Vs. screen in the Vs. Maker generator. The picture comes from the Jim Lee X-Men card set art, a source of many of the real game’s graphics. New sprites of Impulse (Bart Allen), Tiny Titans Kid Flash and Joan Allen were added to the gallery. Also, a very, very old Cyclops-based sprite edit of Wally West as the Flash was added. That Wally West sprite edit was in the DC Comics graphics box at the top of the gallery for years, but was never in the gallery until today. There seems to be a lot of sprites in there that aren’t in the gallery. There’s something suspicious about that, isn’t it? Fastest Week Alive, pt. 1: Gordon’s a SPRITE? 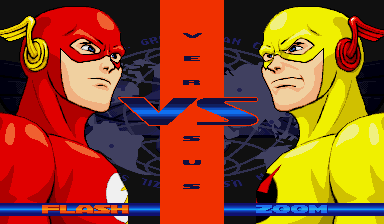 I’ve been a big fan of the Flash since I was only a few pixels tall, so I’m having my own little celebration of the character’s 75th anniversary on both Illmosis and ScrollBoss. The Illmosis site has the new picture I’ve drawn of the Flash and this place is getting a bunch of sprites and a new animation. Everything in the post will be Flash-related either by name or by nature. Let’s hit the ground running with the newness! GFX Generators: All new items, logos and characters added to the GroupShot and VsMaker generators. You’ll get more glimpses of it later this year. This is just a small update with a few odds and ends added to the site, including a few things that I forgot to add in the last update. 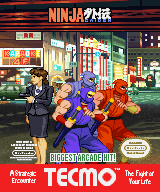 – Tecmo: the new Ryu Hayabusa sprite was improved and another variation was added. – GroupShot Generator: A Tecmo NES (Ninja Gaiden) setup was added to the 160×192 game boxes. Heads-up: Double Dragon Trilogy, a collection of the three original arcade Double Dragon games on Steam right now. It’s on sale for $4.79 until January 22! I haven’t bought and tried it yet, but I will before the sale is over. There will be a themed update for both ScrollBoss and the main Illmosis site next week on January 20th. What’s the theme? Well, it’s on the 20th for a specific reason and I’ll have to upload it before 8 PM. While it isn’t specifically game-related, the theme’s name allows me to slip in some game stuff, including a boss I missed in the 1989 updates. That’s all I’m giving you for now. Tags: Kunio-Kun, Ninja Gaiden, Street Fighter, Super Smash Bros.